Peek at my Week! - HAPPINESS IS WATERMELON SHAPED! It's time to link-up with Mrs. Laffin's Laughings, to tell what's happening next week. I love teaching Social Studies! This week we're starting a new chapter on the Puritans and the Massachusetts Bay Colony. During vacation week, I worked very hard to create an interactive flipchart. Creating this flipchart turned into an enormous undertaking, but the final product contains so much information, pictures, primary sources, review check-ins and video clips. If you want to check it out, there's a link below the map. Check out an amazing prize package/15 winners in all! 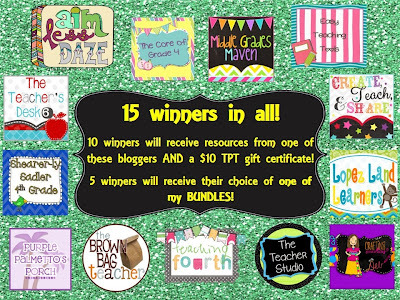 http://crafting-connections.blogspot.com/ to check out a fabulous give-away with 15 winners. This week in Math, we'll be continuing on with slides, flips and turns while continuing to work on our multiplication facts. I love this writing prompt! *Write your name on your paper. *Make sure you have 2 sharp pencils. *When we line up: "Single, straight, silent." *Remember that sentences begin with a capital letter and have an end mark. *Indent when you start a paragraph. *"It's nice to be important, but it's more important to be nice." I think I just went off on a tangent, but I just couldn't help myself - thanks for reading along! Sunday Funday Link-Up and Giveaway Time! New Blog on the Block! Educated vs. smart? A Peek at my VACATION week! Meet the Teacher Monday on a Snowy Wednesday!